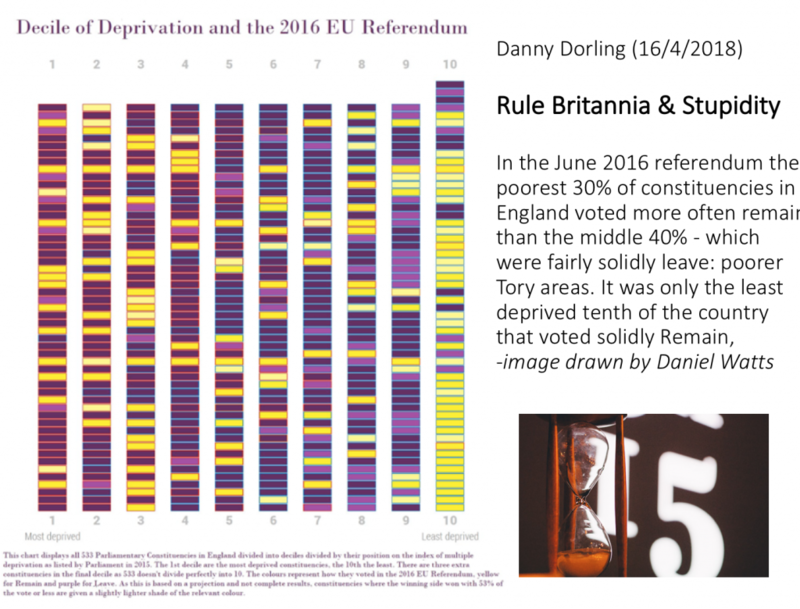 A 15 minute talk on the Brexit Referendum of 2016, Rule Britannia in 2017, and stupidity in 2018, given by Danny Dorling at St Georges, Bristol, as part of a 5×15 event, April 16th 2018. St Georges, Bristol, a 5×15 event, April 16th 2018. 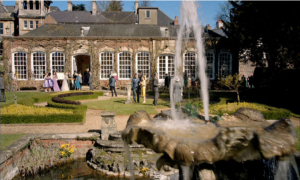 On Wednesday 22nd June 2016 I was cordially invited to a Garden Party in celebration of 20 years of publishing at Policy Press, what is now part of the University of Bristol Press, for ‘Drinks and Canapés’ at The Orangery, Goldney Hall, University of Bristol, Lower Clifton Hill, Bristol BS8 1BH’. 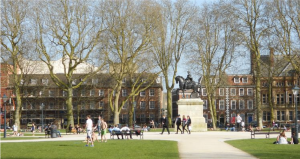 On the morning of Thursday June 23rd 2016 I stumbled out of my friend George’s house on Brandon Hill in Bristol, in the heart of liberal/labour/radical/affluent Britain – nursing a severe hangover. 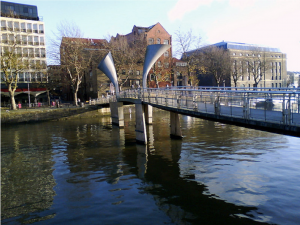 I walked down Anchor Road; across Pero’s Bridge – the bridge named after Pero Jones, the 18th century slave of Bristol Merchant John Pinney, who lived at five Great George Street: next door to where we are now. How far we had come, I thought, that we can now name footbridges after slaves and recognise our past. 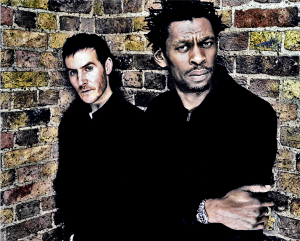 Maybe one day they won’t call Colston Hall after that slave-trader any more – , and Massive Attack will finally play the venue (no that was wishful thinking!). I stumbled across the bridge feeling pleased with myself despite the headache, and walked into Queen’s Square. It was a beautiful morning. A man on a bicycle caught my eye. He was cycling around and around the square with a megaphone in his hand, shouting “Vote Remain”. The EU flag fluttering behind him. Oh yes, it’s the referendum I thought. Must remember to vote. 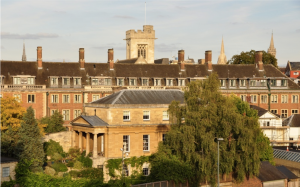 I caught my train in time to get to Oxford for lunch in college – it being important not to miss anything that looks like, and is, a free meal. The talk around the high table was of the spread-betting. Remain were clearly going to win. All the pundits thought so. More importantly the ‘markets’ thought so, and the markets were never wrong. People laying down their actual dollars rather than simply voicing their opinions, had so much more to lose. We had a sweepstake in the college; of what both the turnout and vote might be. The consensus was clearly that Remain would win, it was just a question of by how much and with what volume. The BBC’s Andrew Marr had been at the college a few weeks earlier, explaining that Cameron would have to resign if he lost, but Andrew did not countenance such a loss. We were informed, we were connected, we were unanimous. From the most revolutionary of Trotskyists, to the trendy anarchists, to the Corbyn Labour and old-new Labour, to the Liberals, to the more mild-mannered, the one-nation, or even the obviously swivel eyed Tories. Everyone I met in those days – we were all unanimous. Across the broad church of my social circles we were as one. Across the geographies I travelled Bristol (clifton), Oxford (central), London (elite), we were single-minded. I only heard dissenting voices in the minority, only occasionally and mostly hushed. I went and voted. I assumed I was wasting my time and it was a forgone conclusion; but I quite enjoy voting. And then I went to the college summer garden party, drank prosecco and joked over what might happen if it went ‘the wrong way’. And Guardian Angels sang this strain. Rule Britannia was originally a poem, set to music by Thomas Arne in 1740. The poem was written by the Scottish playwright James Thomson, who was subsequently given a pension of £100 a year by the then Prince of Wales in return for demonstrating such patriotism and skill at early propaganda. 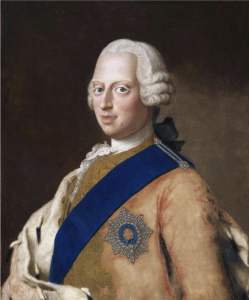 The Prince of Wales in 1740 was Frederick Ludwig of Brunswick-Lüneburg, a grandson of George the elector of Hanover. Frederick had been born in Germany in 1707 when ‘Great Britain’ was only newly being created. He did not step foot in England until 1728. He died aged 44 in 1751, not speaking [much] English. The newly christened British began founding colonies and setting up trading posts. In the West Indies they vastly expanded the infamous global slave trade. Their ‘East India Company’ began the looting of India, and exporting opium and addiction to China. The early Empire appeared to begin to fall apart when those colonists that the English thought were just ‘a rabble of farmers’ in the thirteen American colonies defeated the British army and won their war for independence in the early 1780s. ‘The dread and envy of them all’. Friday 24th June 2016, eating for free again, at a BBQ at a colleagues’ house in Oxford – he was appointed to another department as the same time as me. He is from Germany. He looks glum, very glum. Within a year, he is gone, back to Germany. He had a far better idea than I had of what had just happened and the implications. To an outsider Britain’s failings are more obvious. An outsider has not learnt to live so easily with the bigotry. I looked at the numbers. Lord Ashcroft had commissioned an exit poll. Presumably he had done this to use in the event of Leave losing – to show who had been ‘robbed’. But they weren’t robbed. Ashcroft’s side won. The poll showed that 59% of Leave voters were middle class (A, B/C1). Less than a quarter of Leave voters were in the lowest two classes (D & E). The majority, of Leave voters also lived in the south of England; near, but not in, the enclaves I inhabited. The detailed analysis has shown that the most likely people to vote Remain, in by far the highest and most important numbers, were ‘poorer Tories’ living in southern constituencies. Middle England voted out, far more robustly than the poorest third of England. And in England it was only the best-off tenth that were almost unanimously Remain. Richer Tories might be nasty, and often racist, but they are not stupid. They know what they are doing. Those who supported Leave knew what they were doing, as did those who said they supported Remain but still wanted people to believe that they hated immigration. Våken is Norwegian for ‘alert’ or ‘awake’. On 22 July 2011, the Norwegian, Anders Breivik, who suffered from a narcissistic personality disorder, killed 77 people, most of them children, in a far-right attack associated with his fears – over immigration. In ‘Operation Vaken’, in 2013, the UK Home Office placed adverts about immigration in many shop windows in areas where higher than average numbers of people were not white and not Christian. As part of ‘Operation Vaken’ the Home Office paid for adverts to be included in eight British newspapers that were sold in higher numbers to members of ethnic minorities living in Britain. 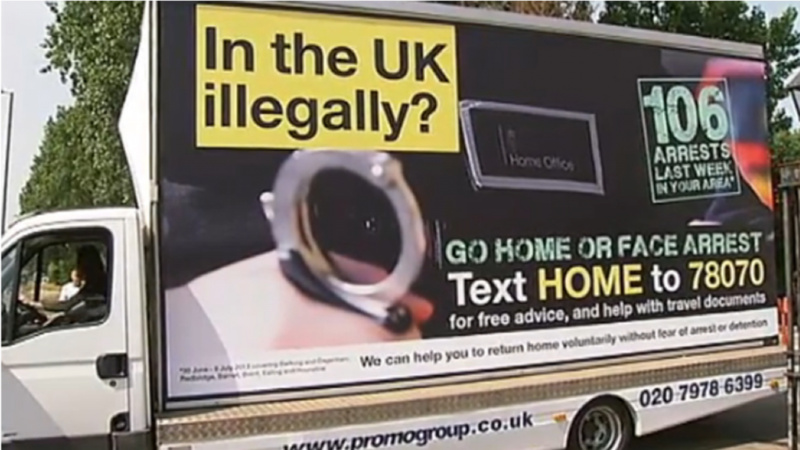 The Home Office had postcards, leaflets and posters especially printed to be put up in buildings used by minority faith and charity groups; and the Home Office paid for vans to drive around London carrying huge billboards. ‘In the UK illegally? 106 arrests last week in your area. Go Home or Face arrest’. The campaign was seen as so illiberal it was even criticised by Nigel Farage. The campaign was ordered by the then Home secretary, Theresa May. It was nasty, vicious and racist. It was prejudice against people of other races, it pandered to the desires of those who believed that a particular race is superior to another. The real audience of the advertisements was not just the people who were terrorised directly by their words; or those made to feel inferior because it was their areas that were being singled out. The largest section by far of the intended audience for those advertisement, the vast majority of people who would eventually see them when printed in the news stories in the tabloids and on their TV screens were poorer potential and actual Tory voters in middle England. Operation Vaken was as much (if not much more) about stoking up the fears and desires of white middle class middle England than about anything else. And it was part of a decades long campaign to blame immigration for the decline of Britain from its imperial glory. On 13 July 2017 Rhodri Philipps, Viscount St Davids, supposedly a descendent of Richard the Lionheart, was jailed for racially abusing Gina Miller, the business woman who won a legal challenge over insisting there be a parliamentary vote after article 50 was ‘triggered’. Rhodri had described her as “a boat jumper’’ and he went on to say: “if this is what we expect of immigrants; send them back to their stinking jungles”. He, like so many of the elite, is stuck with an imperial mentality. Rhodri was the offspring of a British Viscount who married Augusta Victoria Correa y Larraín, from Chile. Someone, possibly someone in Rhodri’s family, is obsessed with genes and where they originate from. According to the website geni.com, sometime after 1565 a man called Antonio Faustino Correa de Acosta was born in Portugal. In 1630 [possibly at the age of 65?! ], in Spain, he fathered a boy named Antonio Correa López Acosta who in 1673 in Lima (Peru) became the father of Cayetano Esteban Correa Padilla Sande. In 1703 in Vichuquén (Chile) Cayetano’s son Manuel Gregorio Correa Oyarzún was born. In turn Manuel became the father of Manuel Gregorio Correa Fuenzalida in Curicó (Chile) in 1753. This second Manuel then fathered Bonifacio Correa Corbalán Castilla in 1785. In 1838, Bonifacio had a son in Santiago in Chile: José Gregorio Correa Albano; who in turn in 1864 fathered Pedro Correa Ovalle, who had a son called (Don) Estanislao Correa Ugarte who then had a daughter in Santiago, Augusta Victoria Correa y Larraín, later Viscountess St. Davids when (on 7 December 1965) she married the then Viscount and on 16th September 1966 in Britain she had a son called Rhodri, who later went to gaol, for being a racist. She is almost certainly his mother, but what do you think the chances are that every single one of these men was really the father of each of their sons without exception? Some people have a perverse obsession with their genes, with where they are from, of what special ‘stock’ they may be made of, and hence why they and theirs should rule – Britannia. Early on in her ill-fated party conference speech in October 2017, before the writing began to fall off the wall, before her voice went, before the protestor rushed up to her, Prime Minster Theresa May mentioned that her grandmother ‘…boasts three professors and a prime minister’ among her offspring. It is worth pondering why Theresa thought that fact was so important? What does drive Mrs May and what does she really believe about herself and about the rest of us? After all, when it comes to Brexit, Britannia, and where next this stupidity will take us, we are now – for a short time – in her hands. She, and the rest of us, are about to learn that our woes were not caused by immigrants in the 1990s, just as they were not caused by the trade unions in the 1970s, or by the socialists in the 1960s, or by every other group that has even been singled out for why Britannia no longer rules the waves. We have a lot of learning to do. A lot more than we presumed two years ago. One of the fastest ways to learn is not just to think about the alternative, but to live it. 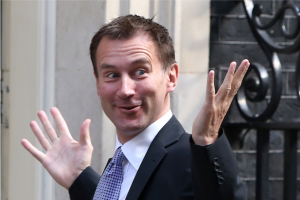 And we, in Britain are about to live the alternative – so who will we blame next when we are not soon great again?